ancientOrigins is a feature of our Family Finder test. This feature compares your autosomal DNA to DNA found at archaeological dig sites throughout the European continent. 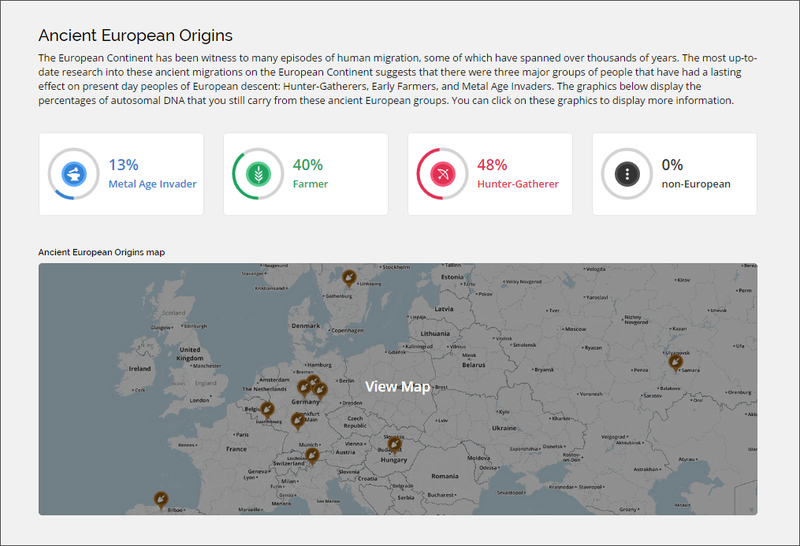 With the inclusion of ancient artifacts found at each dig site, ancientOrigins provides a percentile breakdown of your DNA relation to the three major groups of people associated with ancient migrations on the European continent. As more DNA and scientific information is provided in the future, we hope to expand the ancientOrigins feature to include information for ancient origins outside of the European continent. Note: You can click on the blue boxes ( ) below for more information on each subtopic. 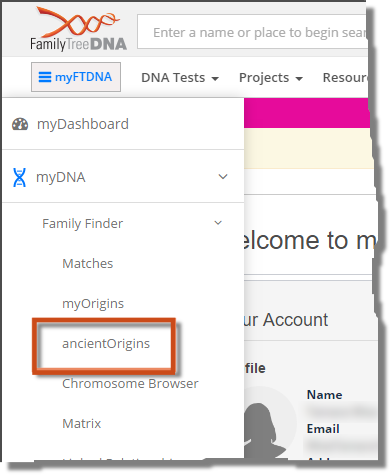 In the upper-left corner, on the menu bar, click myFTDNA > myDNA > Family Finder > ancientOrigins. After clicking on ancientOrigins, you are redirected to the Ancient European Origins page. The Ancient European Origins page displays the percentages of autosomal DNA that you still carry from the three ancient European groups and also the percentage of your autosomal DNA that is considered non-European. Important: It is possible that Metal Age Invaders, Farmers, and Hunter Gatherers influenced groups in other parts of the world. For this reason, your ancient non-European percentage might be 0%, while your myOrigins ethnic makeup contains percentages for populations outside of Europe. For more information on a particular ancient European group or the non-European group, click on the corresponding graphic at the top of the page. You will be redirected to the interactive ancientOrigins page. To view a larger map, click on the map. You will be redirected to the interactive ancientOrigins page. The ancientOrigins page is an interactive page that provides information about each ancient group, group migration routes, and information pertaining to the archaeological dig sites from which ancient autosomal DNA information was obtained. Depending on how you navigate to this page, the page is displayed differently. If you click on one of the ancient group graphics (where your percentages are listed), the ancientOrigins page is opened displaying information about that group on the slide-out menu on the left. On the right of the page, a map of Europe is shown displaying the group’s migration route. 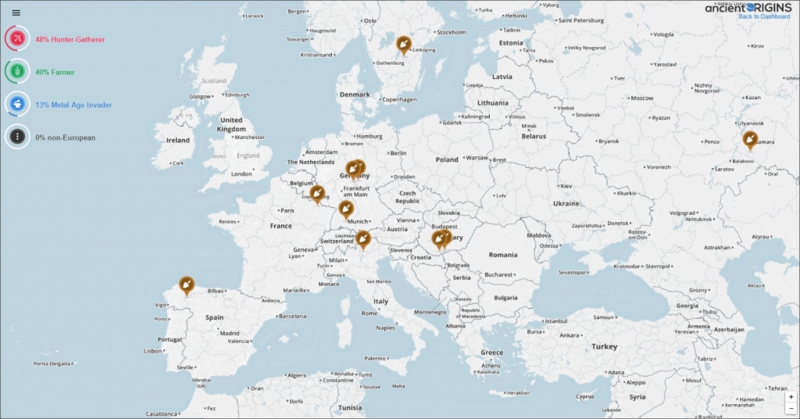 The brown shovel icons on the page represent the different archaeological dig sites in Europe. The below image is an example of what is displayed on the ancientOrigins page when Farmer is selected on the Ancient European Origins page. 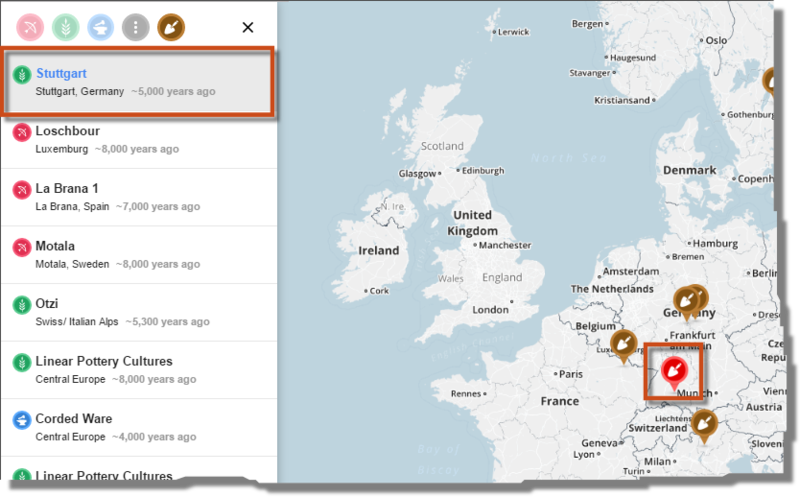 If you click on the map at the bottom of the Ancient European Origins page, the ancientOrigins page displays a map of Europe . The brown shovel icons on the map represent the different archaeological dig sites. On the left of the page, the different ancient groups are displayed along with your relation percentages. On the map, the brown shovel icons represent the different archaeological dig sites. On the map, hover your cursor over the brown shovel icon on the dig site for which you want more information. The icon turns from brown to red. Click on the red shovel icon. 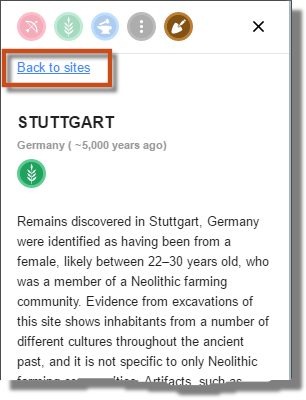 Information for the selected dig site is displayed on the slide-out menu on the left of the page. Continue the above steps for each dig site as desired. On the slide-out menu on the left of the page, the brown shovel icon at the top represents archaeological dig sites. At the top of the slide-out menu, click the brown shovel icon. The list of dig sites is displayed in the menu. On the slide-out menu, hover your cursor over a listed dig site. On the map, the location of the site is displayed with a red shovel icon. On the menu, click the name of the dig site. The information pertaining to the site is displayed on the menu. To get back to the list of dig sites, click Back to sites at the top of the menu. On the map, the percentages of autosomal DNA that you still carry from non-European groups and the three ancient European groups are displayed on the upper-left section of the page. On the upper-left section of the map, click the group for which you want more information. The slide-out menu opens and displays information for the selected group, and the map displays the group’s migration route. At the top of the menu, click any of the other group icons to open the information and migration route for the selected group. Note: You can hover your cursor over each icon to see which group an icon represents. To close the menu, click the X in the upper-right corner of the menu. On the slide-out menu on the left of the page, the icons (other than the brown shovel icon) at the top represent the different groups. At the top of the menu, click the icon of the group for which you want more information. The slide-out menu displays the information for the selected group, and the map displays the group’s migration route. On the upper-left corner of the map, click the three horizontal lines. The slide out menu is opened to the filter. 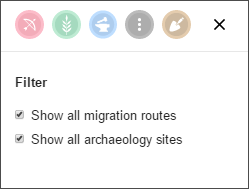 To show all migration routes, select the Show all migration routes check box. To hide all migration routes, clear the Show all migration routes check box. To hide all archaeology dig sites, clear the Show all archaeology sites check box.